Looking for a Used i8 in your area? CarGurus has 692 nationwide i8 listings starting at $57,950. We’ve been living with the car of the future for three years now, and if one thing sticks out, it’s how little the future has changed. The BMW i8 debuted in 2015 to enormous fanfare but has enjoyed only small cosmetic improvements since then. Of course, sometimes standing pat works well; forward-thinking styling, from its dihedral “butterfly” doors to its flying-buttress-style C-pillars, and a revolutionary execution of hybrid technology won the i8 attention from shoppers, journalists, and kids looking for a new car poster to hang above their beds in 2015, and still do today. More on that hybrid part: One of the most noteworthy details at the i8’s debut was BMW’s plan for hybrid propulsion in its halo sports car. 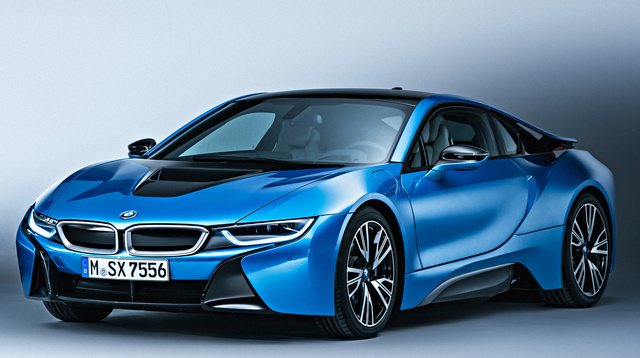 A turbocharged 1.5-liter 3-cylinder engine pulled from the MINI Cooper provides the majority of the i8's power. Of course, while the engine makes a measly 136 hp and 162 lb-ft of torque in the MINI, that wouldn’t be nearly enough to placate i8 shoppers. So BMW tuned and improved the 3-cylinder for the i8 until it was able to squeeze out 228 hp and 236 lb-ft of torque. Even still, those numbers don’t particularly impress, and they won’t earn any car a seat at the supercar table--but that’s where BMW’s hybrid idea steps in. An electric motor works in concert with the gas-burning engine, adding 129 hp and 184 lb-ft of torque, for a total of 357 hp and 420 lb-ft. Now we’re talking. Those figures, combined with the BMW’s liberal use of lightweight materials like aluminum and carbon-fiber-reinforced plastic (CFRP), allow the i8 to sprint to 60 mph from a standstill in 4.2 seconds. Eagle-eyed enthusiasts will quickly note that 4.2 seconds isn’t competitive with cars like the Porsche 918, McLaren P1, or Ferrari LaFerrari, which also feature performance-oriented hybrid drivetrains. However, while those bonafide million-dollar-plus hypercars might make mincemeat of an i8 on a track, they also exist in a separate realm – one outside the reaches of the vast majority of shoppers. The BMW’s merit and significance instead sprouts from its relative attainability. With a $140,700 starting price tag, it will certainly be left off many shopping lists. But nonetheless, that price keeps the i8 in supercar territory, and it represents a different approach to performance – not to mention design – than do cars like the Porsche 911, Nissan GT-R, Audi R8, or even the Lamborghini Huracan. When a car looks the way the i8 looks, performance will naturally spring to mind, but BMW is quick to herald fuel economy, too, using phrases like “an icon of progress” and “the most progressive sports car ever.” Thanks to some realistic evaluations by the EPA, BMW has backed off its initial promotion of the i8 as a 100-mpg machine, announcing instead that, in addition to striking looks and blistering performance, the i8 will deliver up to 76 MPGe. Moreover, once the i8’s battery has been depleted, a full charge will only take two and a half hours via a level 2 charging station. Not that the i8 particularly needs it, but the 2017 model year brings with it some additional aesthetic options, like a Protonic Red with Frozen Gray Metallic accents color scheme, new high-polish black wheels, and some red interior accents on gray seatbelts and headrests and black floor mats. Getting in a BMW i8 is akin to falling in a toilet, but once you’re there, the overall environment is significantly more comfortable. The cockpit is surprisingly restrained, considering the exterior is anything but, and the i8 employs the iDrive infotainment system, similar to other models in the BMW fleet. A selection of three “Worlds” options packages—Mega World, Giga World, and Tera World—effectively give each i8 a specific look and feel (although that look and feel will essentially boil down to “neutral colors” and “earth tones”). To further bolster the i8 owner’s feelings of exclusivity, a Louis Vitton luggage set designed to fit in the car’s limited cargo space is only available to new i8 buyers. Standard features on the i8’s interior include an 8.8-inch color display running the iDrive system, a color head-up display, Bluetooth wireless tech for hands-free calling, a fully digital instrument cluster, HD and SiriusXM Satellite Radio, and a 360-watt, 11-speaker Harman Kardon audio system. The exterior is accented by LED headlights, power-folding heated side mirrors, and the aforementioned butterfly doors and outrageously futuristic styling. When it comes to cars, Matt's curiosity extends well beyond the powertrain. From Ford to Porsche, he's as interested in the history behind the machine as he is the view behind the wheel. Matt creates written and video content exclusively for CarGurus. What's your take on the 2017 BMW i8? Have you driven a 2017 BMW i8?